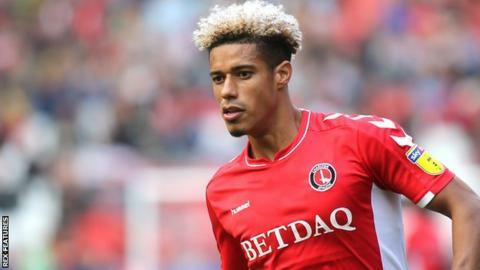 Bradford City are investigating racist messages sent to Charlton striker Lyle Taylor on Twitter following Saturday's League One game at The Valley. The 29-year-old was sent a series of banana emojis from an account which has since been deleted. Taylor scored the only goal in Charlton's 1-0 win. "Officials are working with the police and Charlton to identify the person responsible and ensure appropriate action is taken," a statement said. Taylor highlighted the messages on Sunday morning, commenting "Look at this... Yet another example of ignorant, small minded racism". He later thanked people for their "overwhelming" support following the incident. "The blanket condemnation of one idiot's actions has highlighted the people's true feelings on this matter," he posted. "Thank you for all the messages too, it means the world." Charlton said they take all forms of discrimination very seriously, describing racist abuse as "abhorrent and completely unacceptable". "This is the second time this year that Lyle has been subjected to racist abuse following a game after also being racially abused following the match against AFC Wimbledon in February, an incident that was also reported to the police," a statement on the club website added. "The fact that racist abuse is still seen in football demonstrates work still needs to be done to tackle it. "We will continue our work with various anti-racism organisations and the Charlton Athletic Community Trust on anti-racism and anti-discrimination projects and urge anyone who witnesses racist abuse to report it."